Comfee MF-TN2501-White is a modern hot air fryer that was recently released and is already one of the better selling models on Amazon.com. It is a great multi-functional electric cooker with a 2.6 quart or 2.5 liter capacity and a 1500 watt power (120V and 60 Hz) motor that ensures efficient 3D airflow. Despite being a fairly new release cooking product, there are quite a few customer reviews on Amazon.com and it manages to score 4.7/5 stars out of 19 customer ratings. And the price is fairly low for what it offers- build quality and functionality. You will enjoy the crunchy tasty fries and a variety of fried foods with the three dimensional airflow that makes sure everything cooks evenly and quickly, with an accurate circulation, a balanced hot air distribution and keeping at optimal temperature. And it is not just about frying either, you can also bake, roast and grill different ingredients. The temperature can be adjusted between 175 and 392 degrees Fahrenheit. And you have a timer that can be set up to 60 minutes and shuts off at the end. You can make 2.2 pounds of healthy food with around eighty percent less fat in the 2.6 quart black basket. Although you will manage to cook with no or very little- one tablespoon of oil, the taste and the texture will be exactly the same as deep fried. Both the pan and the basket have the non-stick coating and you can hold the pan by the cool touch handle and take your meal to the countertop. There will be no oil stain or mess from cooking on the bench. You can bake pies, desserts or cakes just like you would in an oven and only quicker, also saving on energy bills. You can roast steaks and a variety of meats and grill your chicken and fish or other meats without any smoke. The pan and the black basket inside the air fryer can be easily detached and put in the dishwasher, but not the rest of the cooker. And you can wipe the exterior with a damp cloth and soap. We’re not sure if anyone would do it anyway, but the seller put a warning on the product page about not immersing the whole unit in the dishwasher. 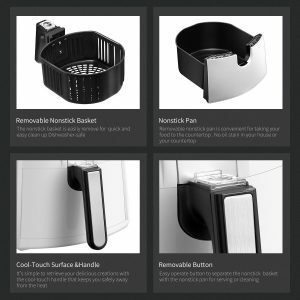 It comes with an anti-slip base that ensures it will stay put when you’re cooking on your kitchen bench. You will find the easy to read, clear instructions on the multi-functional instruction panel. But the instructions manual is not very well written. You can easily adjust the temperature and time by simply turning the temp and time dials and a light and bell will tell you the status. 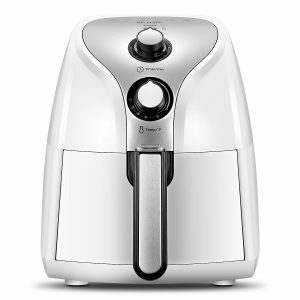 White Comfee Air Fryer weighs 10.2 pounds and measures 13 x 10.3 x 12.2 inches. You can use cooking foil if you want even less mess but you will get better results if you simply place your ingredients in the basket. You can cook either frozen or thawed stuff but it will take longer than normal to cook the frozen. It is able to heat up super quickly thanks to the stainless steel heating element. As an FDA approved and ETL certified small kitchen appliance it is perfectly safe to use. Overall it will save you a lot of time and effort in the kitchen, which is especially good for those not great in the kitchen or lack time due to daily work and other commitments. You will not get a recipe book with this unit but there are plenty of great recipes online. You will get a solid warranty of two years by the manufacturer, which is valid from the day you buy the cooker.